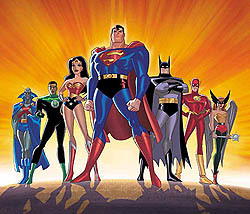 Bruce Timm, who co-produced Batman: The Animated Series and Superman: The Animated Series in the 1990s, became producer on an animated series focusing on the Justice League. The roster consisted of Batman, Superman, Wonder Woman, Green Lantern (John Stewart), The Flash (Wally West), Martian Manhunter (J'onn J'onzz), and Hawkgirl. Kevin Conroy reprised his voice role as Batman from Batman: The Animated Series (1992–1995), The New Batman Adventures (1997–1999), and Batman Beyond (1999–2001). Batman's costume was redesigned, but this time, his costume was a combination of his last three costumes. The same costume from The New Batman Adventures is retained, but with the blue highlights from the Batman: The Animated Series costume and the long-ears from the Batman Beyond costume are added to the costume. Tim Daly, who voiced Superman in Superman: The Animated Series (1996–2000) was initially involved but was unable to continue his role due to involvement with The Fugitive (a short-lived remake of the original 1963 TV series), and was replaced by George Newbern. Superman was initially redesigned to have a bit of a squint to his eyes and slight wrinkles that was also meant to make him look older, in addition to having a noticeable shining streak to his hair; he was redesigned to appear larger in physical girth than in the previous series. Fans did not like the older appearance and in the second season the streak was toned down to the point of almost disappearing and the squint was removed, in essence reverting Superman to his earlier animated look. As an in-joke, Superman's season one facial designs are used for an older Jor-El in the Justice League Unlimited episode "For the Man Who Has Everything". Cover art for the comic Justice League Adventures #1 (2002). Art by Bruce Timm and Alex Ross. Most of the characters retained their general comic book origins and continuity, with Wonder Woman being the notable exception. In the Justice League series continuity, the premiere story arc "Secret Origins" revises the plot of Diana's competition against her fellow Amazons to be the ambassador of peace to man's world, and she is referred to as a "rookie" superhero during her first encounter with the League. (Subsequent episodes touched on her attempts to adjust to her new world). In an interview segment on the Season One DVD, Bruce Timm stated that he initially ran into some legal issues in using the Wonder Woman character, but was adamant that she be used in the series. Additionally, the character of The Flash was portrayed as somewhat younger and significantly more brash than his comic book counterpart, taking on a number of personality traits of Plastic Man, who provides a similar comic relief function in the JLA comics. Charlie Schlatter, who voiced the Flash in one episode of Superman: The Animated Series, was unavailable to reprise the role and was replaced by Michael Rosenbaum. Major changes were also made to the Hawkgirl character. The character of Hawkgirl became romantically involved with the John Stewart Green Lantern as the series progressed. A romantic relationship between Batman and Wonder Woman was also "shown" (hinted at but never "official" unlike Hawkgirl/Green Lantern) by the show's creators, who disliked pairing Wonder Woman with Superman despite fan requests. Robin is not paired with Batman in this animated series like he was on Super Friends. Although the series itself is animated in traditional 2-dimensional style, the opening credits are rendered in 3D with toon shading. The intro is a "stock" intro used throughout the series until Justice League Unlimited premieres. From 2006-2011, Warner Home Entertainment (via DC Entertainment and Warner Bros. Family Entertainment) released the entire series of Justice League on DVD and Blu-ray, and presented in original broadcast version and story arc continuity order. Season One March 21, 2006 26 Contains a set of 4 DVDs with all of the episodes from the first season as well as audio commentaries, interviews, and other special features. Season One August 19, 2008 26 Season One has been re-mastered and re-issued as a set of 3 Blu-ray Discs (in full 1080p and with Dolby Digital 5.1 surround sound) with everything included on the prior release. Season Two June 20, 2006 26 Contains a set of 4 DVDs with all of the episodes from the second season as well as audio commentaries and a panel discussion involving the production team of the series (although the set packaging indicates a featurette hosted by voice actor Phil LaMarr, it is misprinted, the featurette is on Disc One instead of Disc Four). Despite the show having been produced in a widescreen format this release lacks anamorphic encoding. Season Two July 26, 2011 26 Warner Home Video released Season Two on a two-disc (50GB each) Blu-ray set. Warner Home Video also released another DVD title Justice League The Complete Animated Series. It contained all 91 episodes of Justice League and Justice League Unlimited on a 15 disc set with the 15th disc containing a bonus documentary. Justice League April 23, 2002 Contains all three parts of "Secret Origins". A mini-DVD version of this disc has also been released. Justice on Trial April 22, 2003 Contains "In Blackest Night" and "The Enemy Below". Paradise Lost July 22, 2003 Contains "Paradise Lost" and "War World". The Justice League Collection April 13, 2004 Contains previous "Secret Origins," "Paradise Lost," and "Justice on Trial" DVDs in a three-pack with a slipcase. Starcrossed The Movie July 13, 2004 Contains "Starcrossed" in both widescreen and fullscreen. A mini-DVD version of this disc has also been released with only fullscreen. The Brave and the Bold October 19, 2004 Contains episodes "The Brave and the Bold" and "Injustice For All". Challenge of the Super Friends to Justice League: April 13, 2004 Contains the previously released "Justice League" (Secret Origins) DVD along with two Super Friends discs in a slip-case. Justice League: 3-Pack Fun July 19, 2011 Contains "The Brave and the Bold" and "Injustice For All", as well as the Justice League Unlimited episodes "For The Man Who Has Everything," "The Return," and "The Greatest Story Never Told," and the Young Justice episodes "Independence Day," "Fireworks," "Welcome To Happy Harbor," and "Drop Zone". A 4-disc soundtrack of musical highlights from both seasons of Justice League was released by La-La Land Records in July 2016. It is a limited edition of 3000 units and can be ordered at the La-La Land Records website. The set includes tracks from fan-favorite episodes like A Better World, Hereafter, Wild Cards and Starcrossed. La-La Land are hoping to release a soundtrack for Justice League Unlimited as well, provided that sales of the Justice League soundtrack improve significantly and that there is sufficient demand from fans. A second Justice League volume may also follow if fans support the existing release. The show was aired in the Republic of Ireland on TG4 from 2002 to 2007. The series has received acclaim. 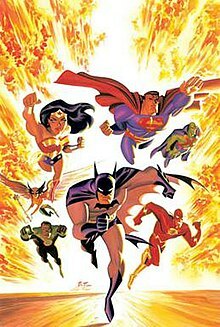 In January 2009, IGN named Justice League/Justice League Unlimited as the 20th best animated television series of all time. In 2014, WatchMojo.com ranked Justice League/Justice League Unlimited as the fifth best superhero show in their top 10 Animated Superhero TV series. ^ Dimino, Russ (October 2007). "The Many Faces Of... Superman". KryptonSite.com. Retrieved April 11, 2012. ^ RTE Guide, September 2002.